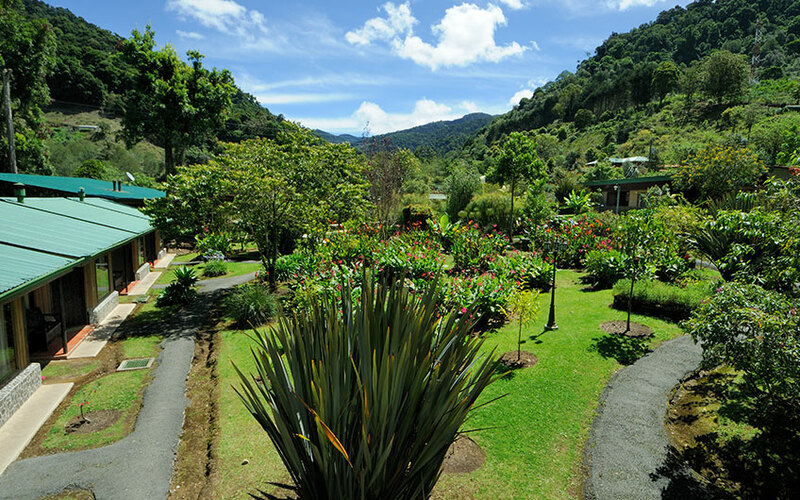 San Gerardo de Dota Costa Rica is one of the smallest spots in the Central American beautiful country, an unparalleled area to rest, relax and be off the beaten track. It is an isolated place, full of nature beauties, interesting, unique and authentic; you will be surrounded by plantations, humble and friendly farmers, simple but nice hotels and restaurants, perfect to taste delicious typical food, a good Costa Rica coffee and admire the amazing green mountains, feel the cold, clear and pure water, breathe fresh air and walk on a secluded paths, no paved roads and listening the wind playing with the trees and the birds. It must be included in your Costa Rica vacation package, we at Travel Excellence can guarantee that this will be the trip of the lifetime! It is located in the Central Valley of Costa Rica, south east from our capital city. San Gerardo de Dota Costa Rica belongs to San José province. Drive to the south of San José, using the Pan American highway, on route to Cerro de la Muerte. From San José Costa Rica to San Gerardo de Dota region it can take 3.5 hours approximately. There are also public buses that usually departs from San José Costa Rica, the problem is that it requires more time, because makes more stops on route. The buses arrive to San Isidro de El General and from there, you should take a 4x4 cab. 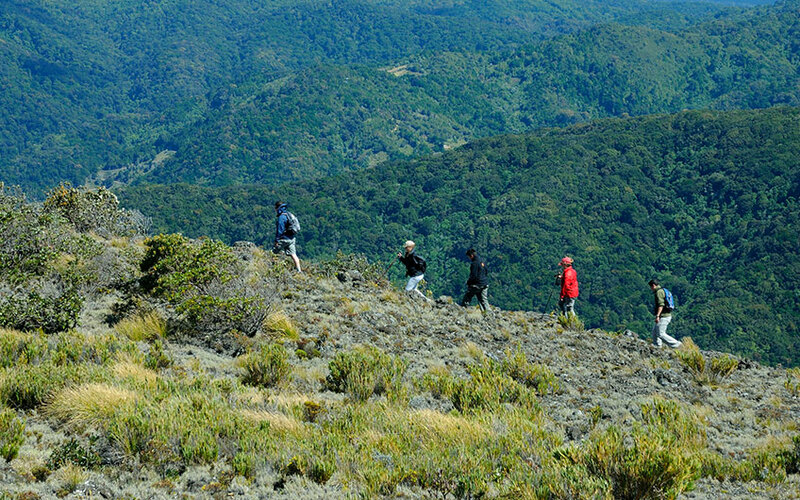 If you are adventurous and want to have your own schedule, maximize your time and visit and explore more places in the surroundings, is better to rent a 4x4 car, the road can be bumpy and muddy on rainy season and it is not paved road. 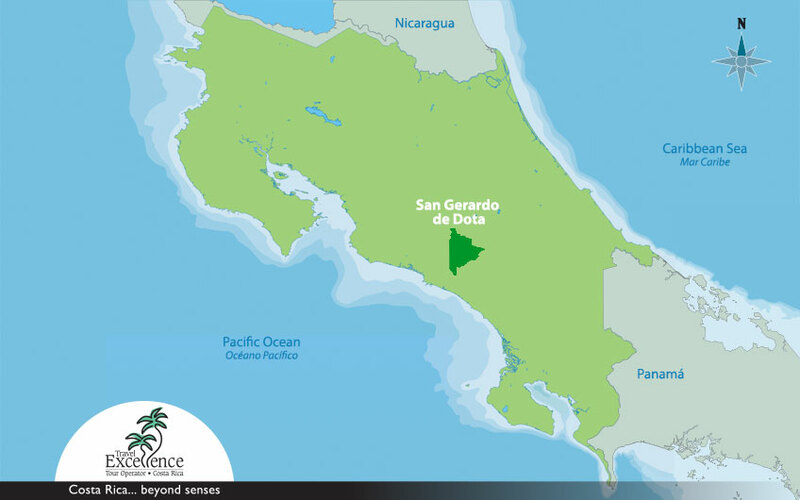 We invite you to take a look to our Costa Rica map, so you can have a better idea of where San Gerardo de Dota Costa Rica is located, and how you can get there; we are also providing important information about our best spots, attractions and some of the activities that we are able to offer. San Gerardo de Dota is a warm but fresh region most of the time, especially during the mornings and part of the afternoon, the average temperature is between 12 – 14 °C, rain is very common in the area and it is present during almost all the year. The best season to visit the area is from December to April, but you should consider that rains will be present too; from May to November is the rainy season, and especially in September and October you will find much rain than in the rest of the year. San Gerardo is a small town that belongs to Dota, part of San José. It has a population of around 7 000 habitants, that is the reason why it is one of the least inhabited places in the capital city, even though, it is the fourth biggest canton of San José Costa Rica. During the Pre-Columbian period, the place where Dota is located, were occupied by Huetar Indigenous. The first colonizer of Dota, one of the persons that discovered the indigenous graves was José María Ureña Mora. In 1870 was built the first church in Dota, in 1925 the ex-president Ricardo Jiménez Oreamuno founded Dota as a “canton”, the street lighting arrived in 1969. Before that, in 1948, Dota was headquarters of the revolutionary army, during the administration of president José María Figueres. It was a group of indigenous that lived in the Central Valley of Costa Rica, during XVI century; they were colonized by the Spanish conquerors and in 1675 all the Huetar indigenous that lived in the Central Valley spoken Spanish. They practiced the agriculture of corn, beans and some other products, and worked with stone and made important and interesting hand crafts. It is marked by conservation and preservation of the heritage and natural resources, the downtown is dedicated to agriculture, the place is inhabited by local farmers, welcoming people that live in harmony with nature. It is a place that has been preserved as it is: small, rural, isolated, beautiful, with a lot of natural richness and green mountains, all the restaurants, or hotels were builded using stone, wood, very simple, but cozy and charming; you should know about its culture during your family trip to Costa Rica. San Gerardo de Dota Costa Rica is world known by its nature beauty, its green and exuberant forest, the isolated paths, eco-tourism and the most important activity is the birdwatching; there are a lot of incredible bird species, including the Resplendent Quetzal. Even though it is a paradise of beautiful landscapes, it is a known place for investigation, there are protected areas that are visited by scientists to different purposes. San Gerardo de Dota Costa Rica birds are popular and almost like the stars for the birdwatching tour in our country. Most of the birdwatchers come to this beautiful Central American country to look for Resplendent Quetzal or the different species that are living in the highlands. Taking advantage of the natural richness there, you can do on your Costa Rica vacation packages, horseback riding, can visit amazing waterfalls, walk in the undiscovered trails, visit the farms to see how people live, take adventurous tours like the canopy and much more. While you are on your Costa Rica family holidays, do not forget the protected areas, where virgin forest can be found, great to be in contact to wildlife. 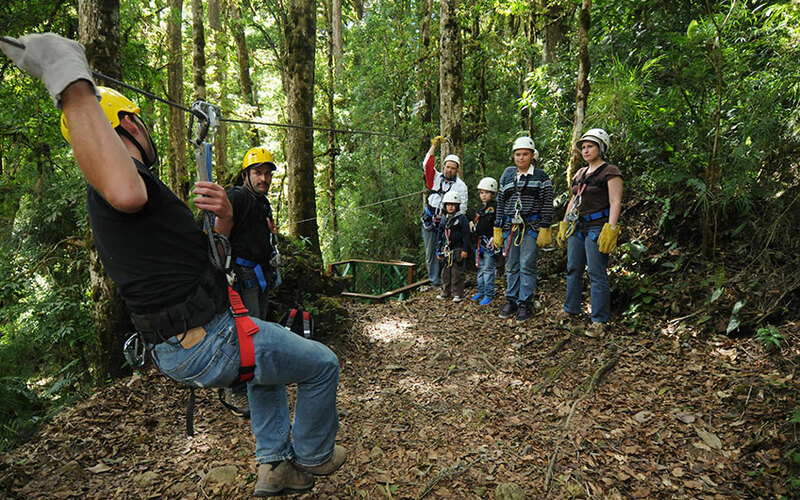 It is a special tour for your Costa Rica family adventure package, it is offered by Trogon Lodge and is a nice activity, where you can enjoy the landscape and see Savegre River while you are sliding over the tree canopy in most of the platforms. 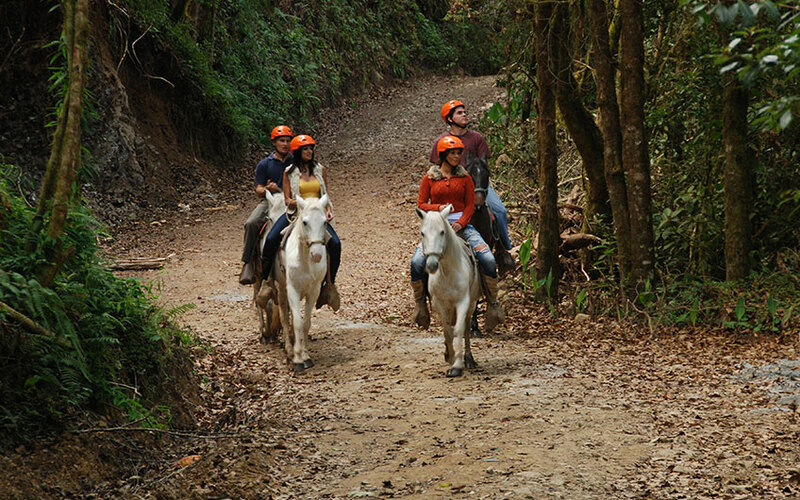 A perfect activity for those who are looking soft adventure, you can ride on the green mountains, admiring the unparalleled views, visit attractions like the waterfalls or just to meet the imposing forest, it is not recommendable for your Costa Rica vacation package, if you are travelling with children. 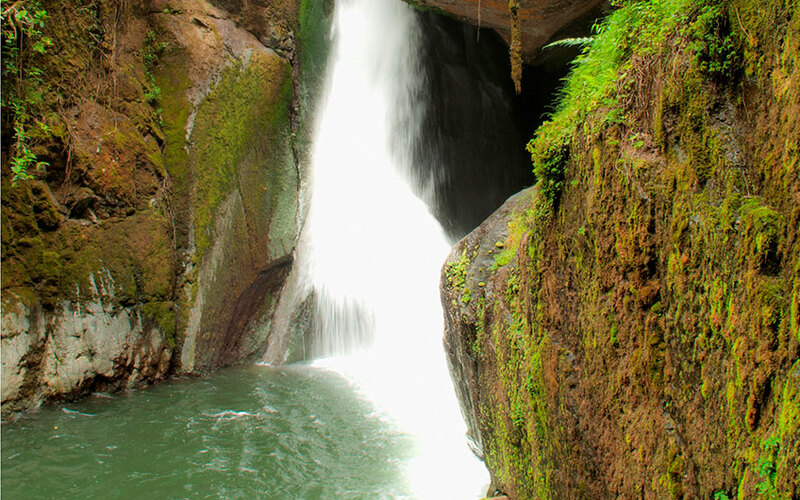 San Gerardo de Dota Costa Rica offers you the opportunity of seeing the incredible Savegre Waterfall, you can explore the mountain walking or by horse, to get to the astonishing place, clear and fresh water is the perfect scenery to forget the busy world and breathe fresh air. 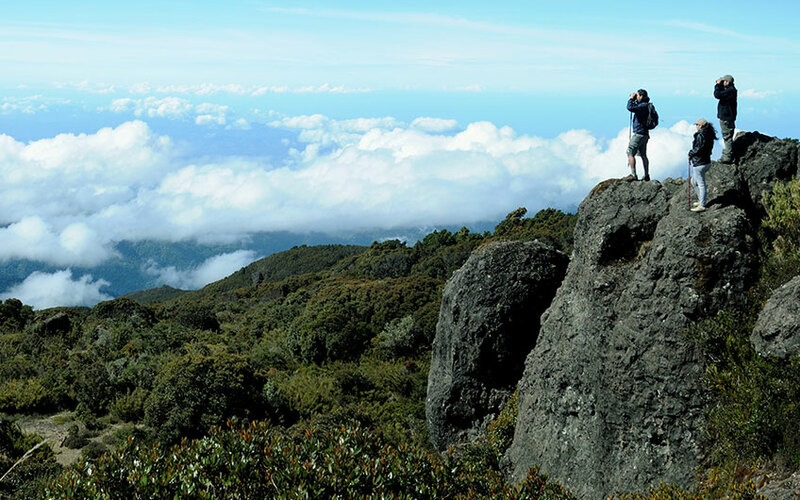 Another option for your Costa Rica family adventure itinerary can be the walking to Cerro de la Muerte, where you can see a lot of birds and beautiful landscapes, it requires to be in a good shape and is recommendable for experienced people. 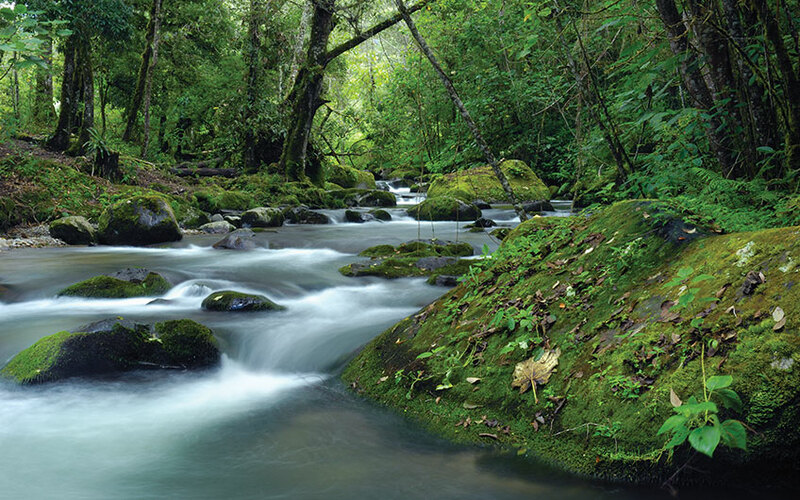 This national park is one of the recent parks created in Costa Rica, it has an extension of 5 000 hectares approximately. Additionally, it is home of endemic and endangered animal species, including the amazing Quetzal, very well known by its beautiful colors. San Gerardo de Dota Costa Rica is part of our highlands, it has an elevation of 2 200 meters above sea level, that is the reason why it is possible to find the Resplendent Quetzal, actually it is offered as a tour for those who come only to see them, so we mean that you can go to San Gerardo de Dota Costa Rica to take a birdwatching tour in general or a “Quetzal quest” tour too. In the area, you can easily see birds, especially hummingbirds in the hotel gardens, almost 200 different species can be seen from San Gerardo de Dota Costa Rica. 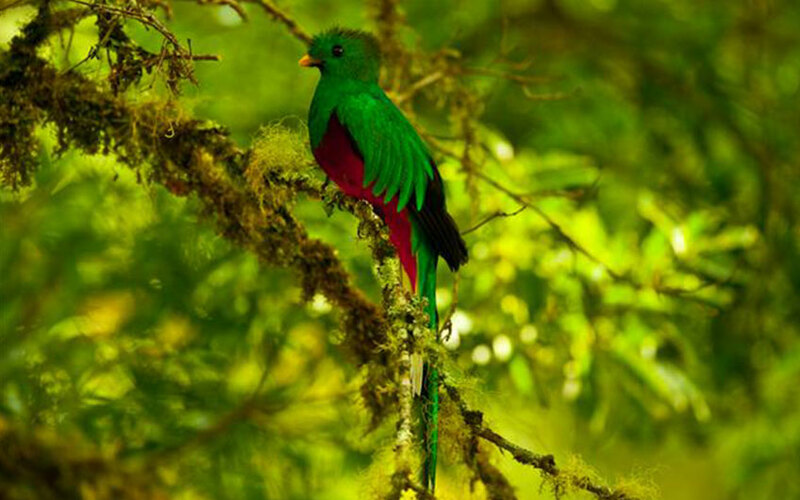 The best season to see the quetzal is between January and April and from February to April is their mating and nesting. It is one of the best hotels in the area, they operate different tours with their own guides and equipment, including the canopy, a good option for your Costa Rica family adventure holidays, it is immerse into the green forest, rustic but charming hotel, with a nice lake in the property. It is a superior category hotel, small, rustic too and cozy. Perfect scape for your Costa Rica honeymoon, it has beautiful gardens and a private 400 hectares reserve, plus a spa to relax and be disconnected from the world. If you are looking luxury during your Costa Rica vacation package, this is the best option. 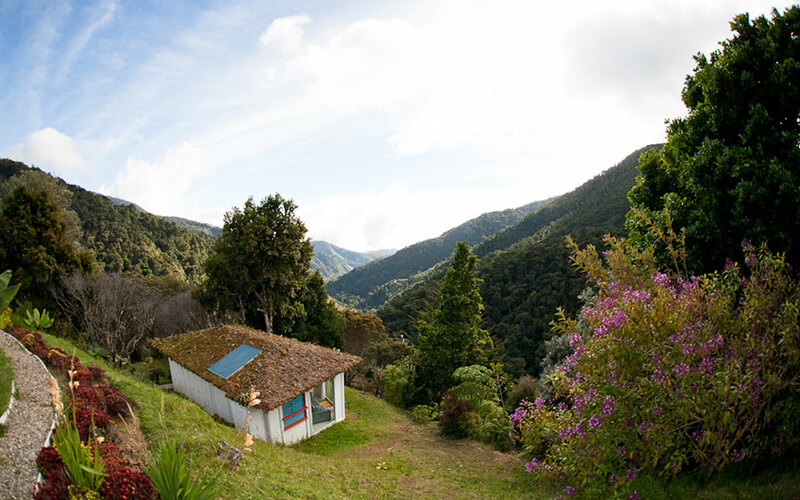 They offer private and separate bungalows, immersed into the forest with amazing views and privacy. 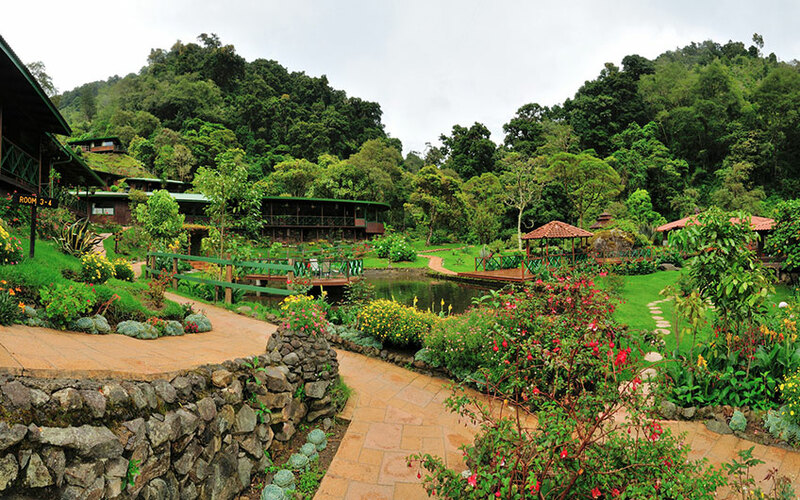 The property also has a private cloud forest reserve, for those looking for nature, wildlife and luxury. 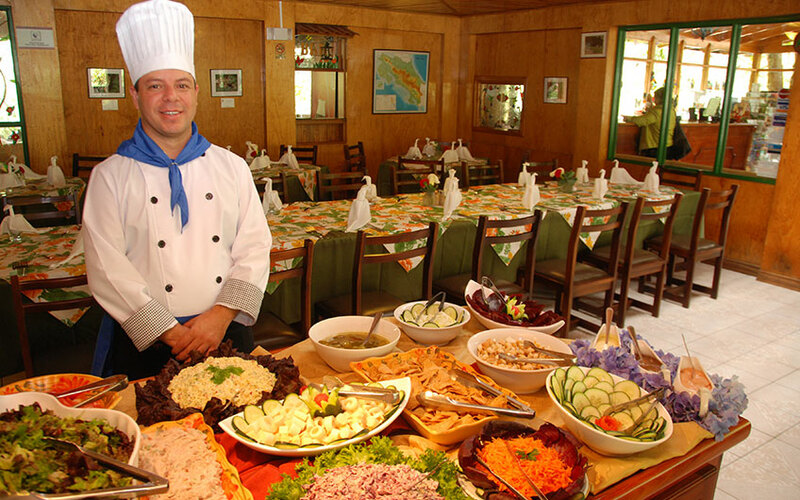 Most of the restaurants that are located in San Gerardo de Dota Costa Rica offers a good combination of local and international food. There you can taste delicious typical flavors, do not forget to eat the famous “gallo pinto” for breakfast, it consist in rice and beans mixed and accompanied with sour cream, tortilla and eggs; or the “casado” for lunch that includes rice, beans, a meat (can be chicken, fish, pork or beef), accompanied with plantain, vegetable hash and green salad. It is an open Italian pizzeria, up to vegetarians, vegans or celiac people, it is open from 09:00 to 21:00. Open air restaurant, up to vegetarians, celiac and vegans. A combination of restaurant – cafeteria with local food. Opens from 08:00 to 17:45. This is a typical restaurant that also offers Latin and Central American food. It is a very familiar, open restaurant that is open from 11:00 to 20:00. This restaurant offers a combination of South American and Costa Rican food; the restaurant opens from 07:00 to 19:00. This is a very good spot to spend the night in a cozy bar – restaurant, drinking a beer or a wine glass, maybe a good coffee, because Dota produces one of the best coffee brands of Costa Rica. It is not a place to go out looking for discotheques or open bars, it is a place to share with family, friends or if you are travelling alone, why not? Sharing with locals or the other tourists, maybe walk in the hotel gardens to admire the nature, the sky or just listening the ambiance and relax atmosphere, it is incomparable so please do not lose the chance of experiencing it while on your Costa Rica family holidays. Additionally, it is very romantic to share a good jacuzzi, a champagne glass with your husband or wife at night, during your Costa Rica honeymoon. 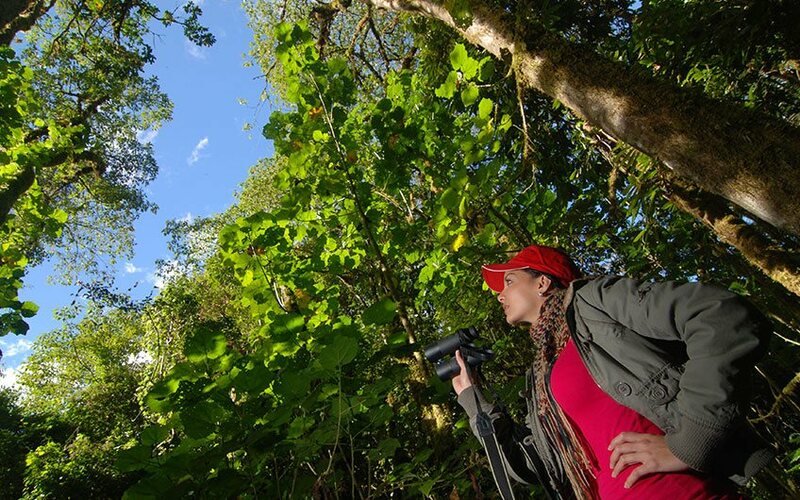 Costa Rica Birdwatching Tour, it includes San Gerardo de Dota Costa Rica. If you need us to prepare your tailor made Costa Rica vacation package, or if you want more information about San Gerardo de Dota Costa Rica and its beautiful attractions, we at Travel Excellence are waiting to hear from you, so please do not hesitate in contact us. Do not forget to leave us a comment if you liked this article too, and please continue reading our Costa Rica travel guides.